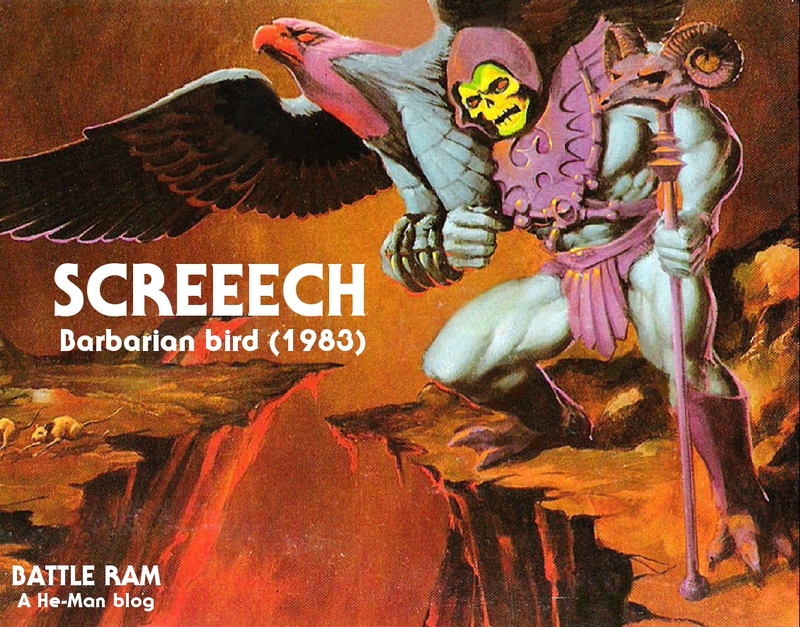 My first memory of Screeech (yes, his name is spelled with the extra “e”) is from kindergarten. There were a couple of days during the year where kids were invited to bring a favorite toy to school to show to the class. 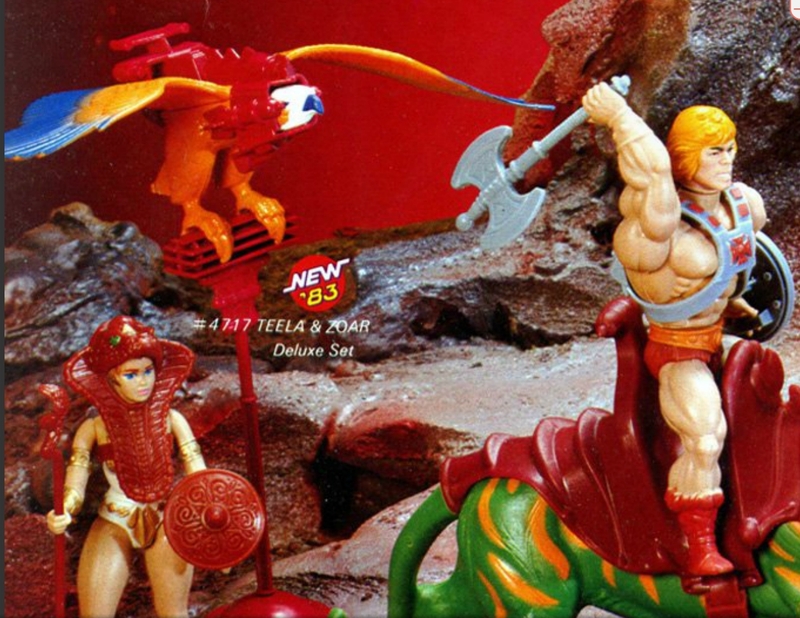 On one occasion I recall bringing in Mer-Man, who I was enamored with at the time (and still am). But another boy brought in Screeech. I owned Zoar, but I had never seen this purple and blue repaint. 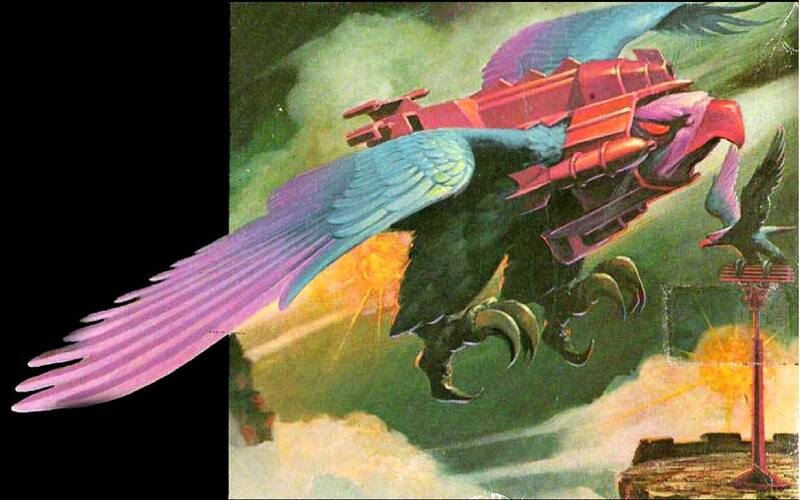 Screeech makes all kinds of thematic sense in the Masters of the Universe scale of cosmic balance. 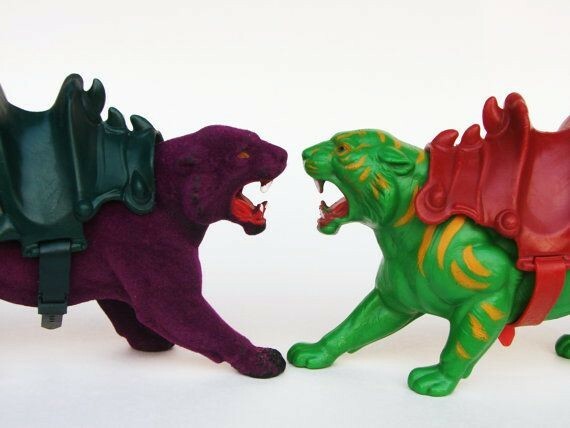 For every Battle Cat there is a Panthor. 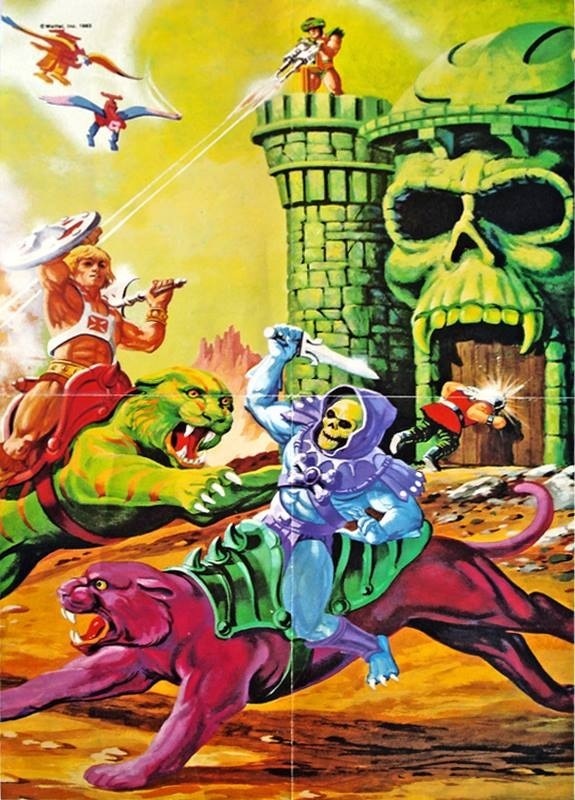 For every He-Man there is a Faker. And for every Zoar there is a Screeech. 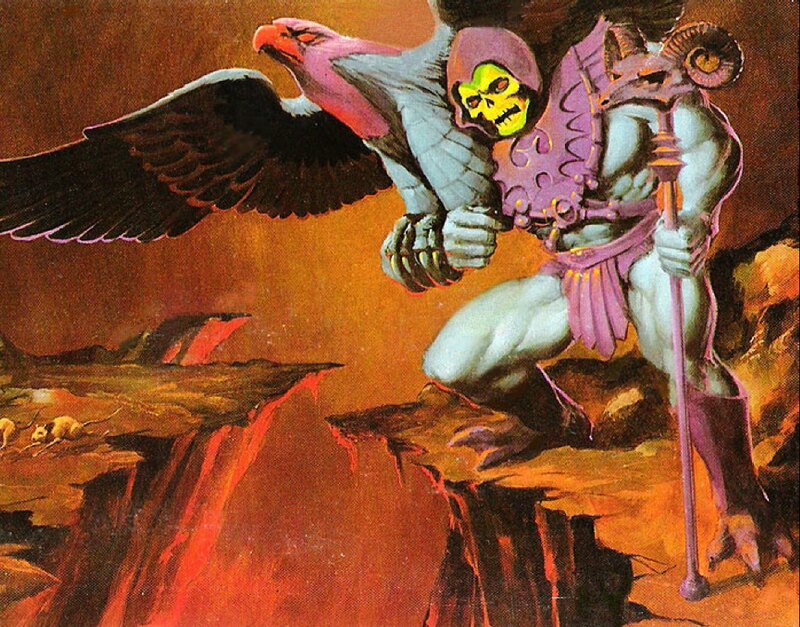 In fact, the colors for both Screeech and Panthor were chosen by the same designer at Mattel – Martin Arriola. 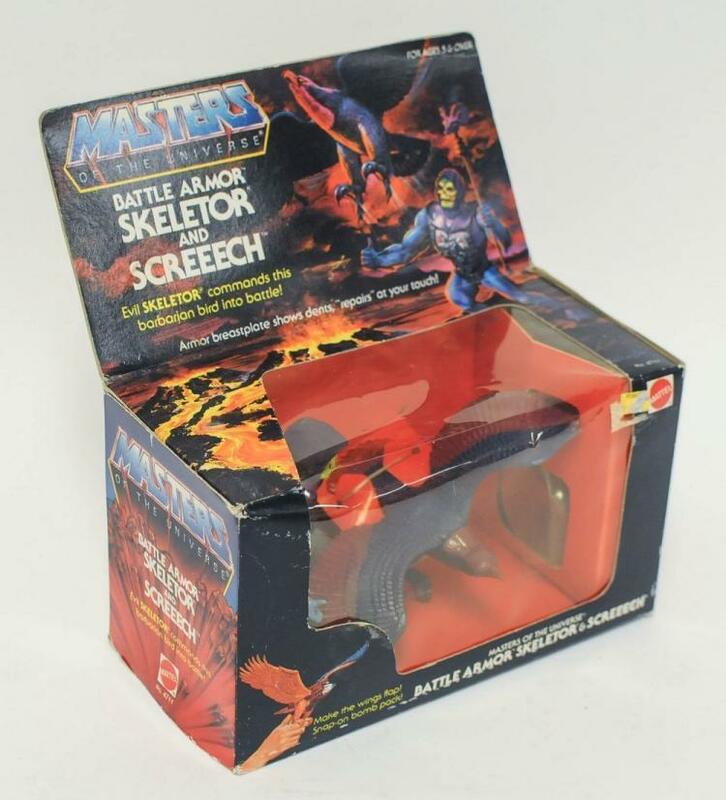 Screeech was sold individually, in a gift set with Skeletor, in a gift set with Battle Armor Skeletor, and in a gift set with Trap Jaw. 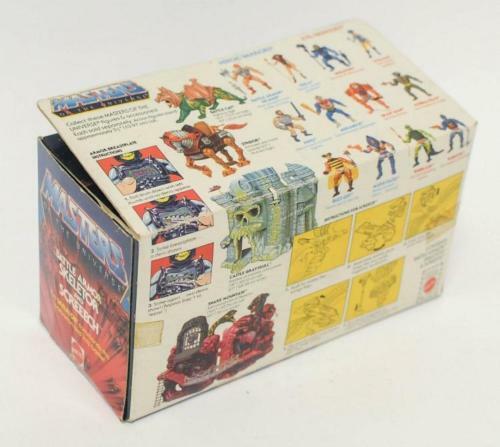 The packaging illustrations for the first two sets were painted by Rudy Obrero, who also did the artwork for Castle Grayskull, Battle Cat, and many others. 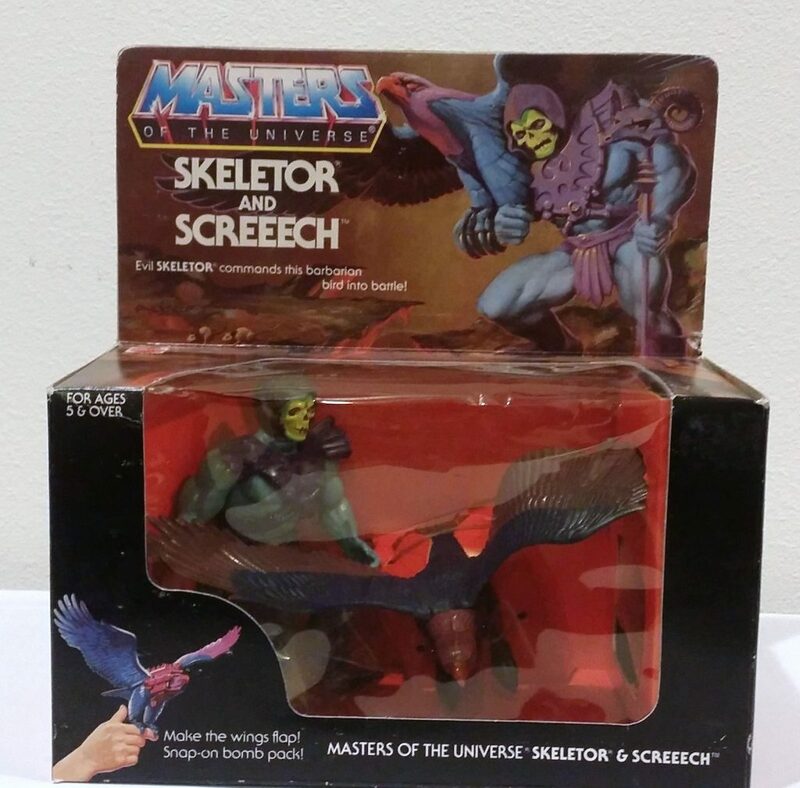 Screeech is probably the most obscure character from the first few years of the MOTU toyline. He was rarely depicted in stories or television, and when he was shown, it was usually very much in the background. 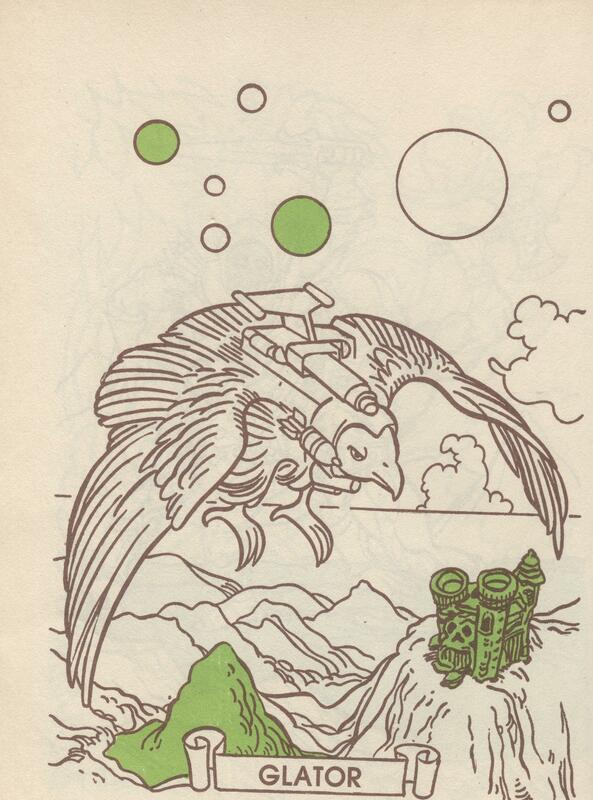 A noteworthy exception to that is in the Golden Books story, The Sunbird Legacy. 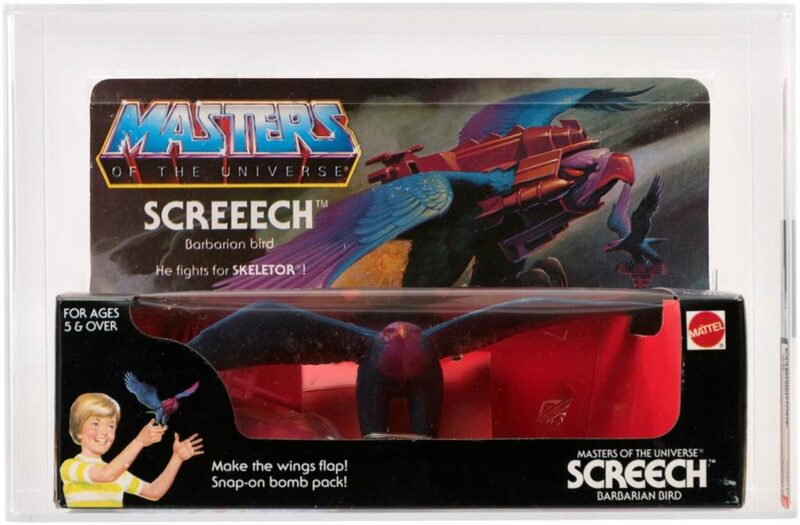 In the story, Evil-Lyn has the power to transform into Screeech. 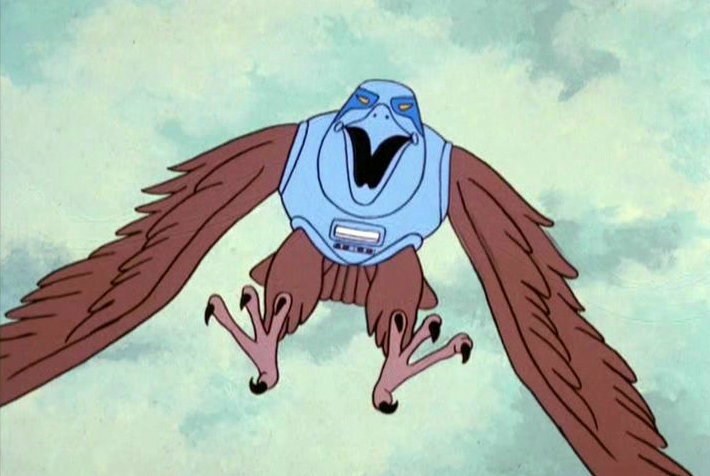 This ability gives the character some nice symmetry with Filmation’s version of the Sorceress. 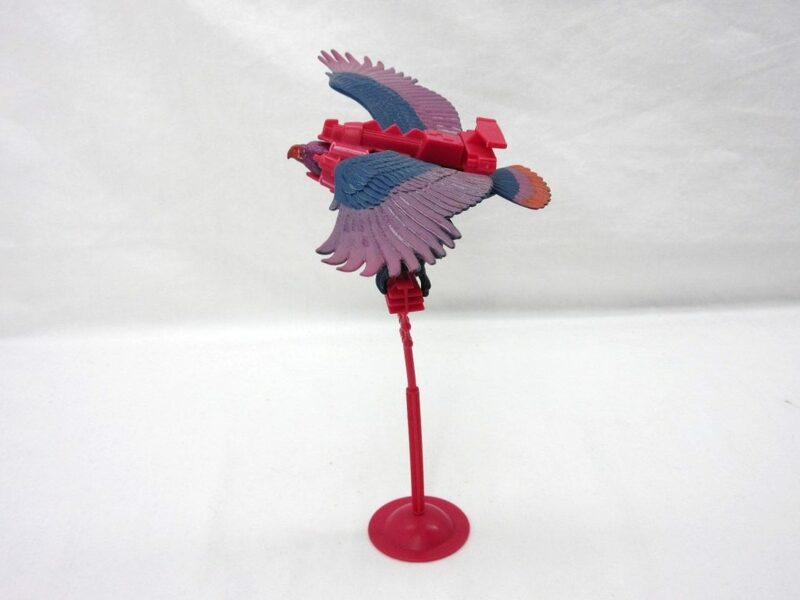 In Sunbird, Screeech resembles a buzzard rather than an eagle or falcon. 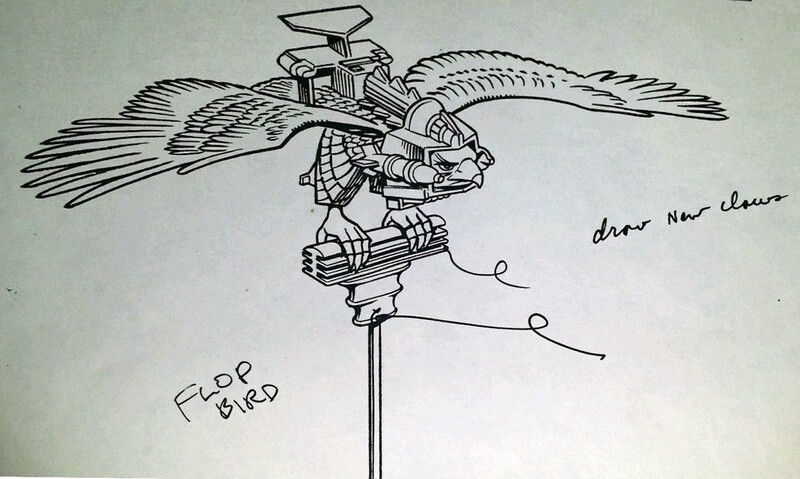 I’m not sure if that’s because the artist wasn’t given a visual reference for the character, or if there were plans early on for Screeech to have a unique buzzard appearance. 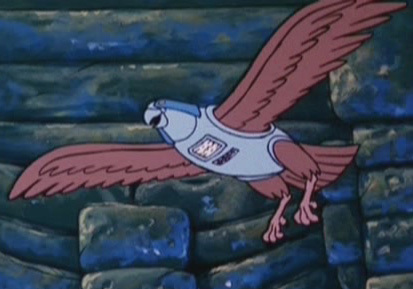 According to James Eatock, the name for Screeech in the original cartoon scripts was the Robot Raven. 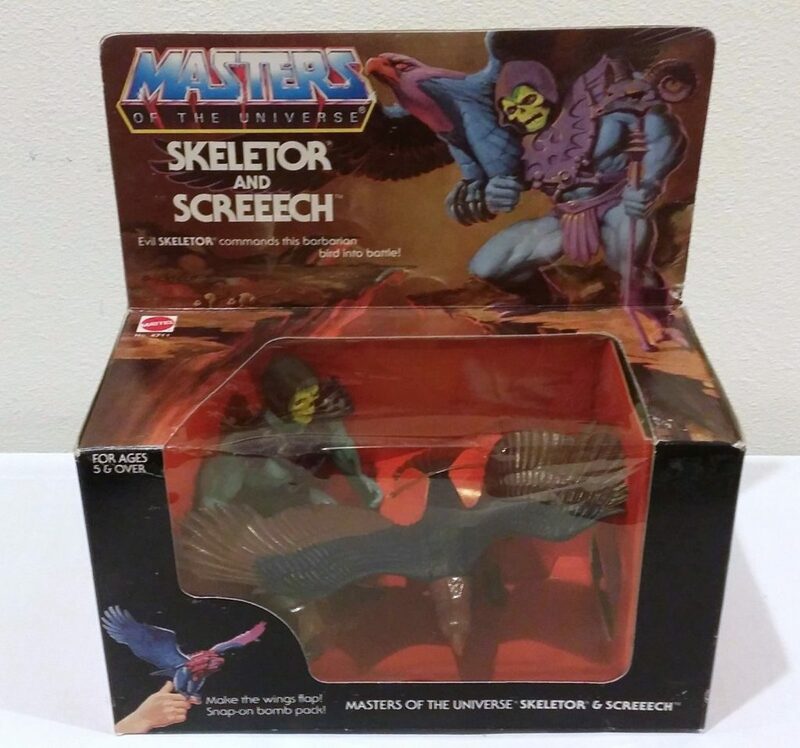 Perhaps this was actually a character invented by Filmation, but renamed Screeech at the last minute to tie things back to the Mattel toy. 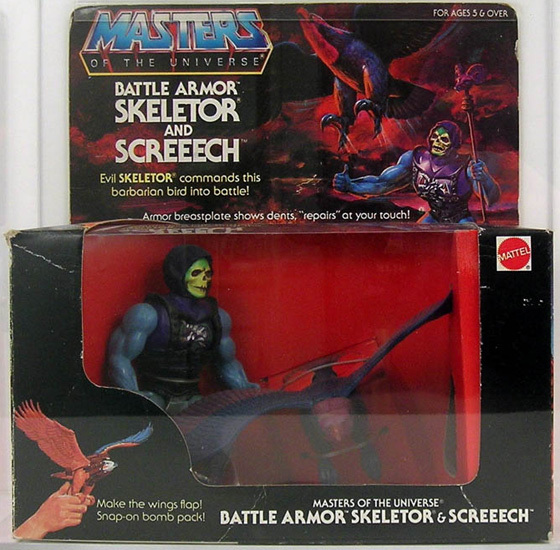 interesting.. the battle armour Skeletor and screeech set features un-recoloured Zoar art.. okay, not that interesting but oh well. of course, one problem with Screeech is unlike most of the re-colours, there is 100% NOTHING new here. 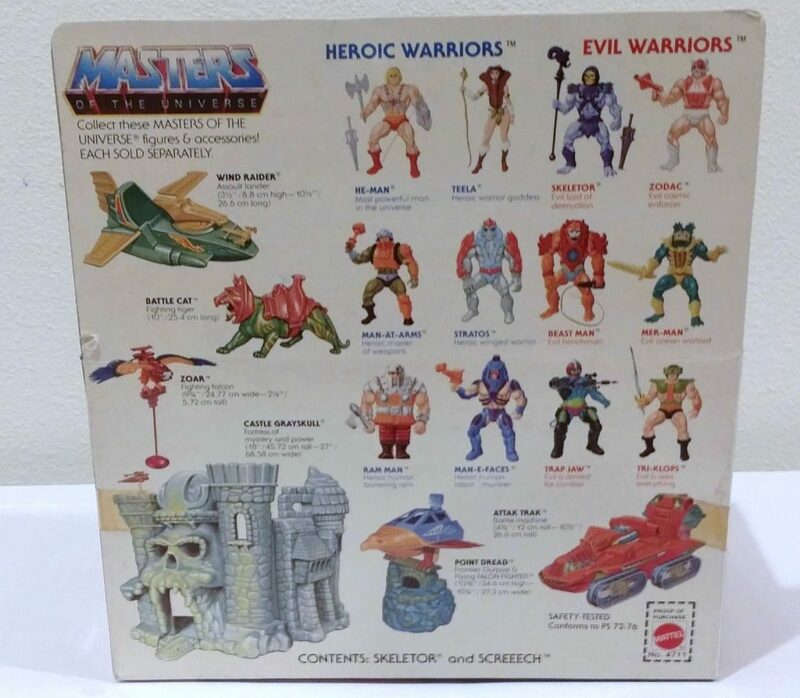 No ‘different armour’ as with Faker and Stinkor, No extra fur as with Moss-man and Panthor, no smell as with Stinkor and Moss-man.. Screeech is just Zoar with different colours. 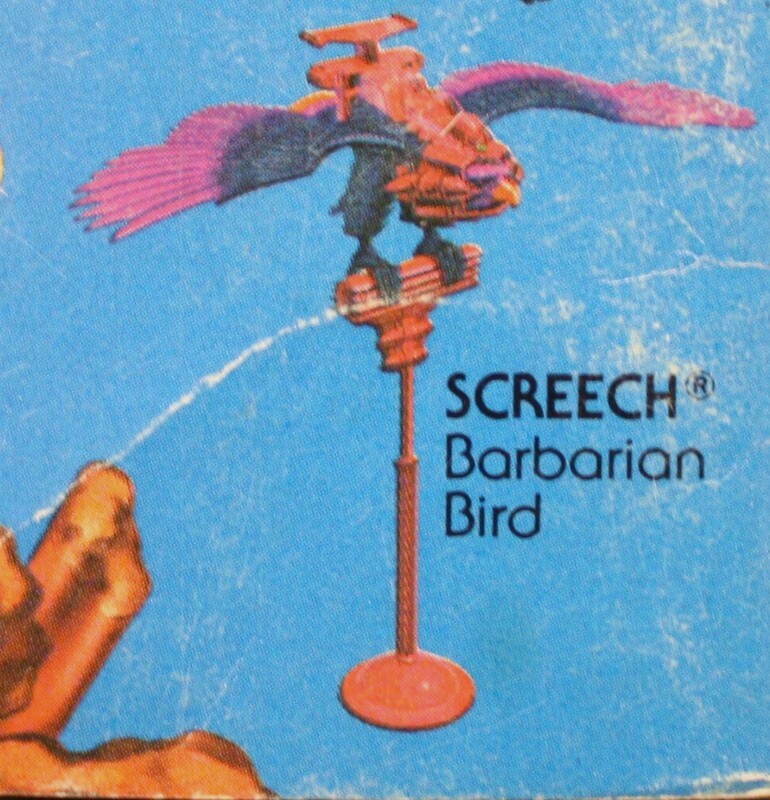 Yeah, the standard Screeech release has the same thing – although the BA Skel/Screeech set is zoomed in on bird. Yeah, you’re right – they didn’t go above and beyond to make Screeech more interesting. Even his armor is the exact same shade of red as Zoar’s. If they had given him a new armor design that might have helped. The cross-sell art on the back of the Power of Point Dread seems to have left off an “e”. 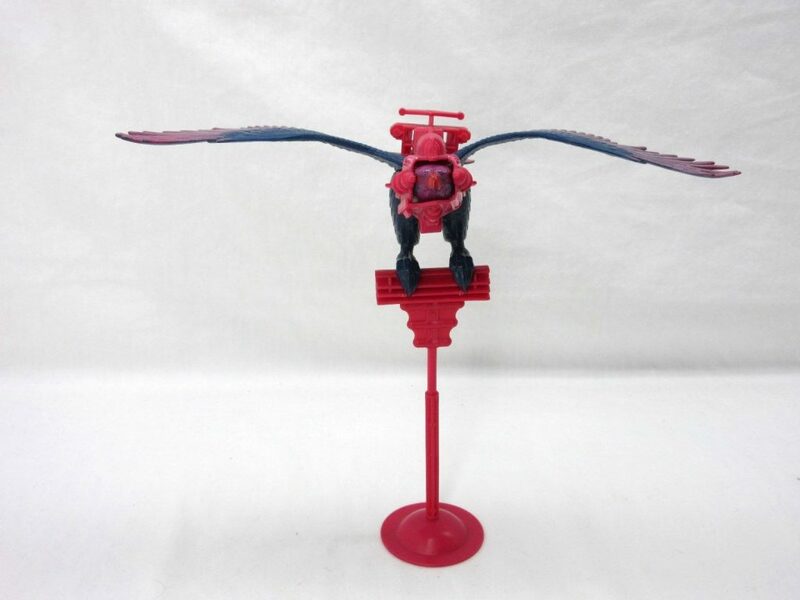 I have Screeech and as toy I liked him a lot, until one day the rubber wings slided half way off from the main body: as kid I never succeeded in repositioning them and only as adult I tried again and finally did it. 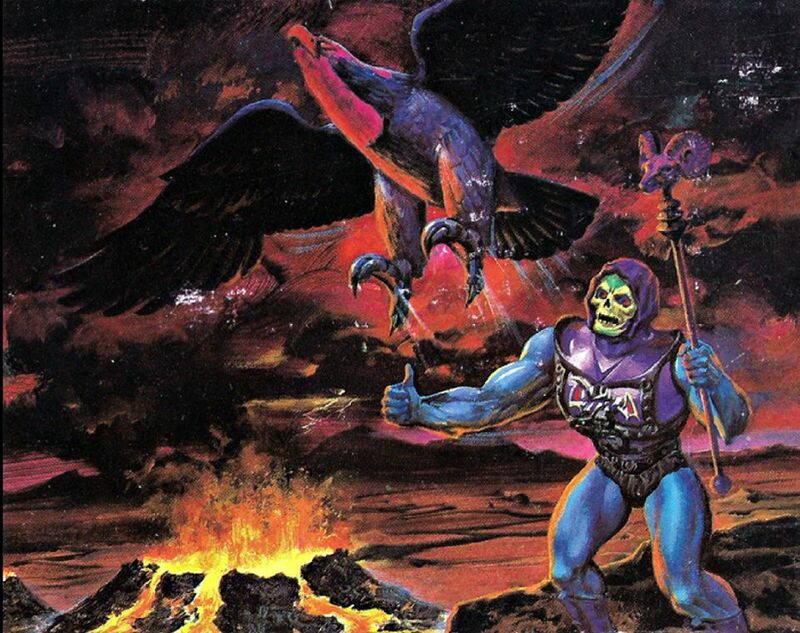 My only disappointment was about his claws to being unable to grab a figure or to stand on Skeletor’s arm. 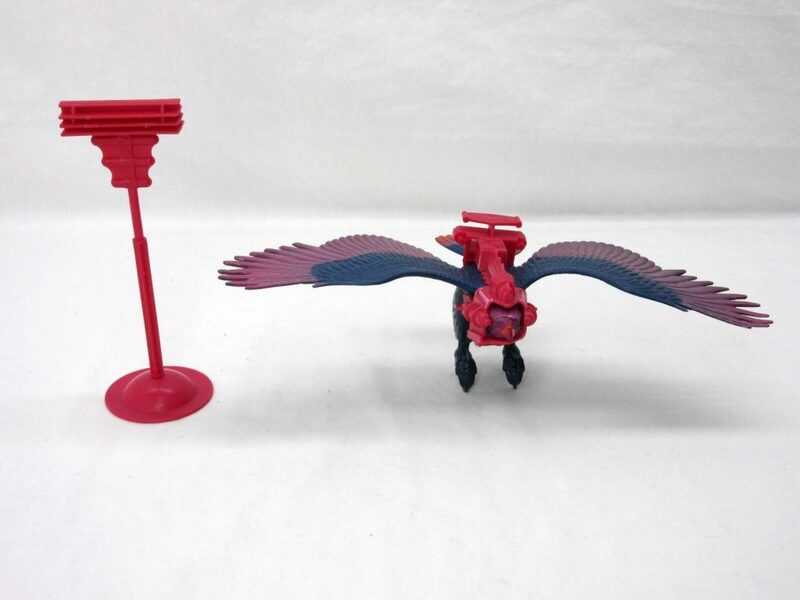 However, Zoar has a better color scheme because each color stand out nicely: in Screeech on the other hand the purple and the red are too similar. 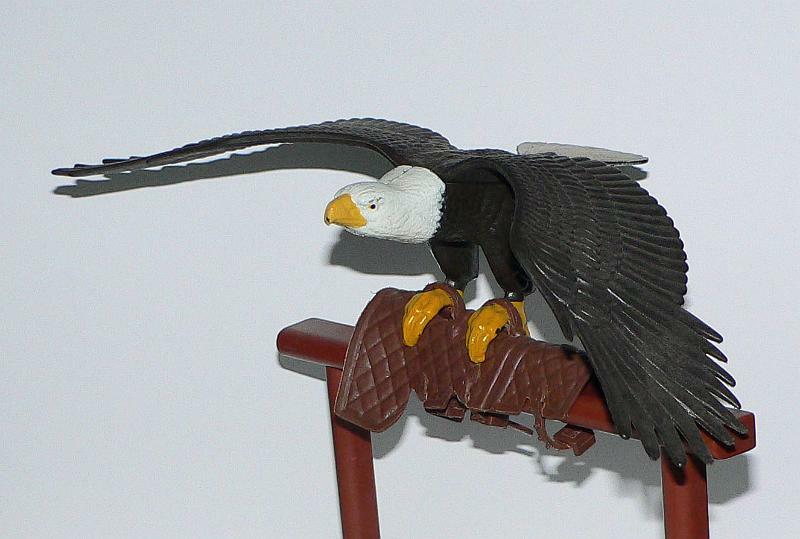 For example, On the head the purple feathers and the red eyes and beak do not stand out enough. 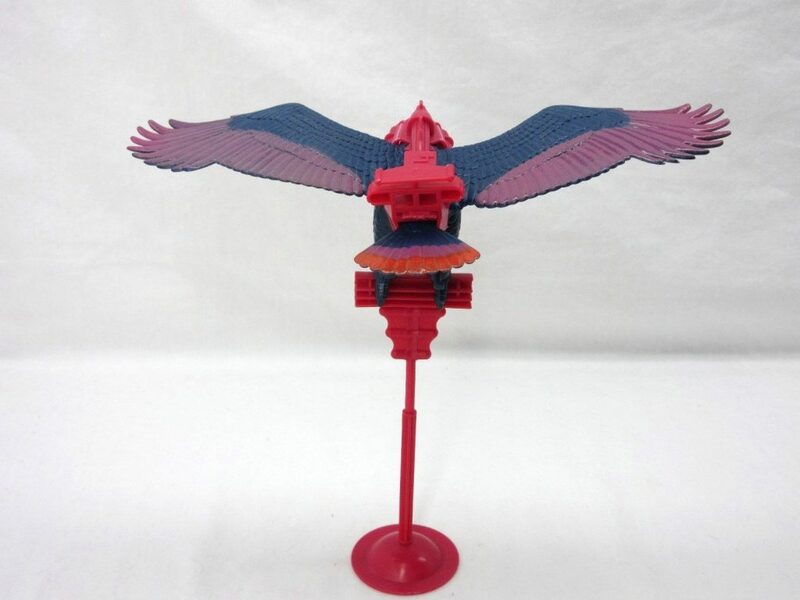 Sadly I lost the harness eons ago and the perch broken very quickly (I wonder why they released toys with parts that were so obviously fragile, like the perches and the Wind Raider’s wings). 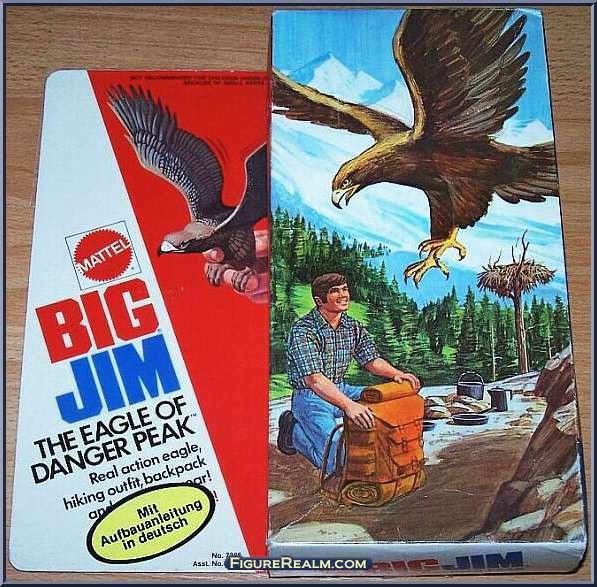 I never had a Screeech as a child. To be honest, on my limited pocket money, it wasn’t one that really jumped out and grabbed me as a particular “want”. I never had Zoar either, as likewise I found it to be a bit “clunky” and not a “come and buy me” pocket money incentive. However, Zoar benefited from a much more vibrant colour scheme. Although purple and blue can independently be quite strong colours, on Zoar they just turned out quite dull-looking together. 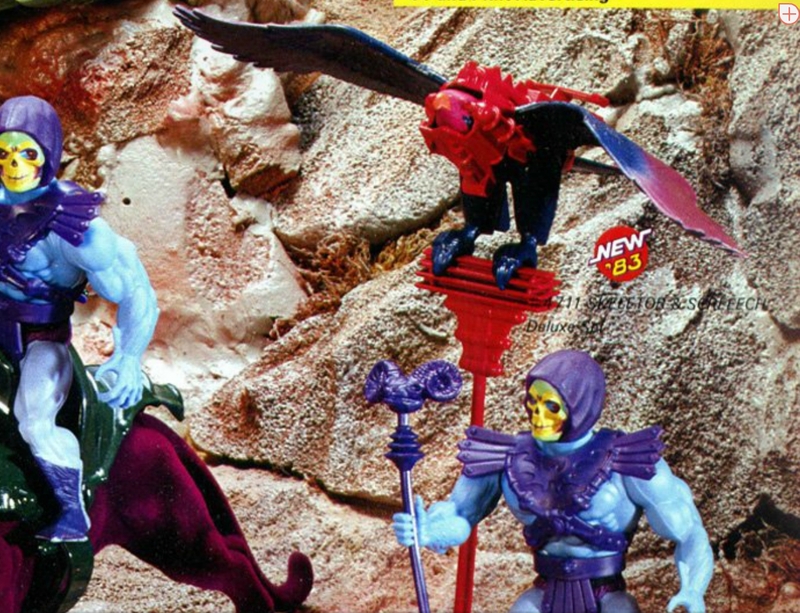 But whereas other simple repaints such as Battle Cat and Panthor, and most famously Faker (likely my all-time MOTU figure) had individual new ‘character’, Screeech just never felt very developed, more of a “what simple repaint can we knock out this wave” and little more to make it stand out. 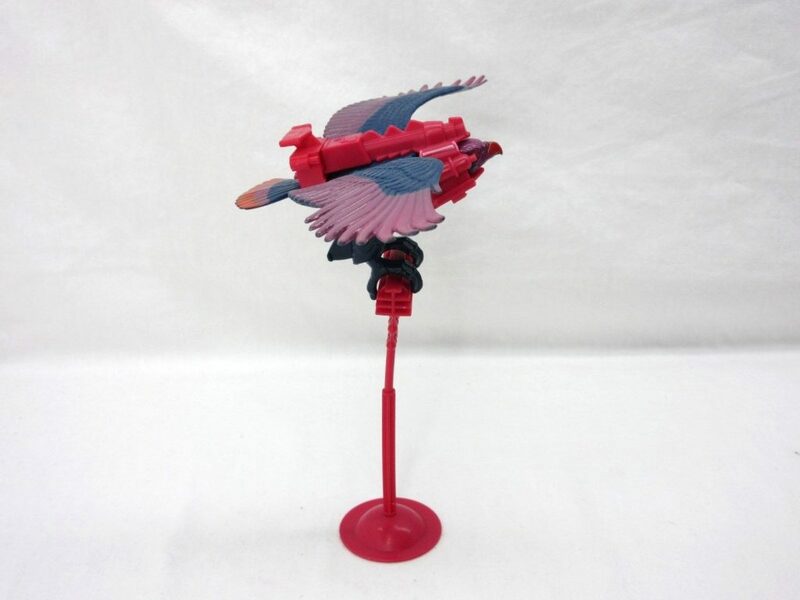 As others have commented, the fact it had exactly the same accessories (clunky rocket pack which never even fitted Zoar well) and the perch it would never sit on properly… it just didn’t really appeal. 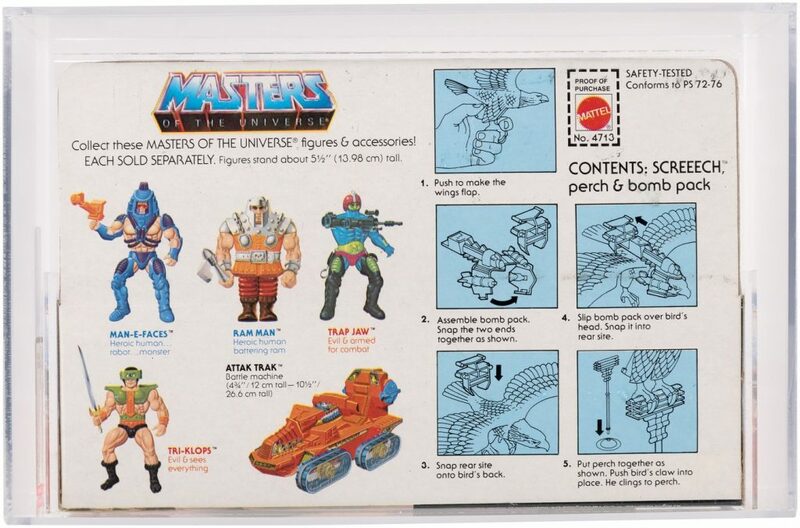 At least they could have given it a new, more “evil”-looking rocket pack at least.